Priority in a task indicates its importance and defines the sequence of processing of tasks for the users. Priorities set is displayed to the user in the form of dropdown list while creating, editing the tasks, and also while executing the operations. To each of the priority there corresponds a name and importance, expressed by a digit. This importance is taken into consideration while sorting the tasks in the lists. Greater the digit, higher is the priority. One priority from the set must be selected as a default priority. Moreover, for the workflow there must be assigned at least one priority. So as to edit the priorities in the workflow, go to the page of this workflow through the menu, and thereafter — to the tab "Priority". Press the button "Create Priority in the middle bar. In the window that opens, enter one or several priorities. While entering several priorities, set them one in a row. Thereafter press the button "Save". You can set the order of priorities for the workflow tasks by moving them in the priorities list with the help of buttons. Similarly in this list, you can change the default priority. After entering all the changes, press the button "Save below the form. 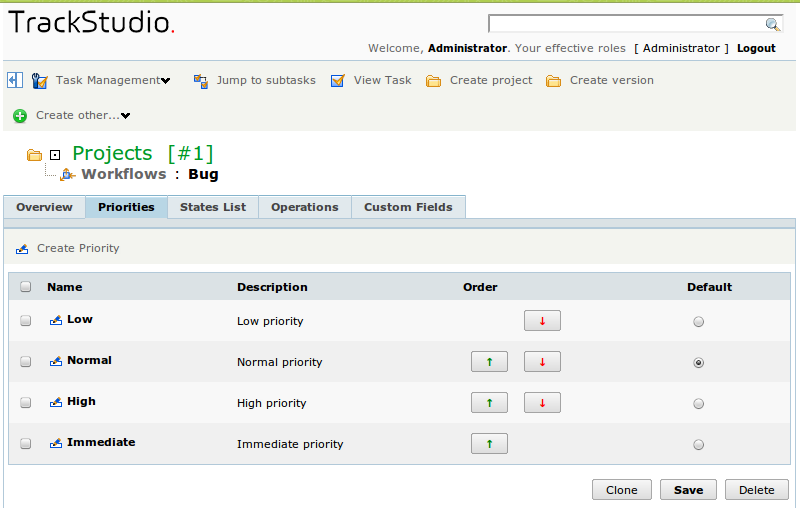 So as to change the name of the priority, click on the icon in the row of required priority. In the form that opens, enter the new name of priority and, if required, change its parameters. Press the button "Save" below in the form. So as to delete one or several priorities, mark them with a flag in the list and press the button "Delete" below the form. You can’t delete a priority from the workflow if it is already used in the existing tasks.